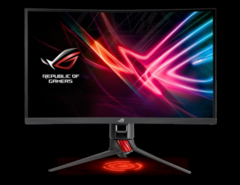 Pre-orders have started for the Asus ROG Strix XG27VQ, which combines a curved display, 144 Hz refresh rate, and a blue light filter with a FullHD resolution. The lower resolution means that users with mid-range graphics cards can use this screen without having to deal with blur from running at below native resolution. Many large curved monitors run at resolutions that are prohibitive for all except owners of high-end laptops or desktops. The Asus ROG Strix XG27VQ aims to be both affordable and usable on mid-range computers. Asus' new monitor is a mix of entry level and higher-end features. When looking at the specs, the odd one out is that it is only 1920 x 1080, while most monitors at 27-inches would be running at something around 1440p or higher. However, this trade-off means that Asus was able to give the screen a 1800R curve, a refresh rate of 144 Hz, and AMD FreeSync while still keeping the price at US$350. Essentially this means that users with mid-range GPUs can enjoy a curved screen and high refresh rate gaming, while users with high-end cards can crank up the visuals and still benefit from the high refresh rate. The refresh rate is also nice and low at 4 ms gray-to-gray, which gamers will appreciate. Due to the FullHD resolution, Asus was able to make do with the older HDMI 1.4, Displayport 1.2, and DVI. There is an inbuilt blue light filter to reduce eye fatigue and the adverse effects of blue light at night. For customisation, there is height, tilt, and swivel adjustment for all those people who keep purchasing desks with uneven legs. It also wouldn't be a modern computer peripheral if it didn't have RGB, so Asus has included that too. US pre-orders are now open at retailers including Amazon and Newegg with a retail price of US$350. No confirmed shipping date yet.